Because I often field questions about how I create my Large format photography, my large format camera is a good place to start. Most people want to know how I can create such large vibrant prints and what kind of digital camera I use. They are always surprised to learn that I use a large format 4×5 film camera to capture all of my fine art images. There are lots of reasons I explored and have subsequently stuck with a 4×5 camera despite its dated technology and painstaking workflow. Below is a picture of the 4×5 camera that I affectionately refer to as “The Big Rig” which I use to capture all of my fine art prints. 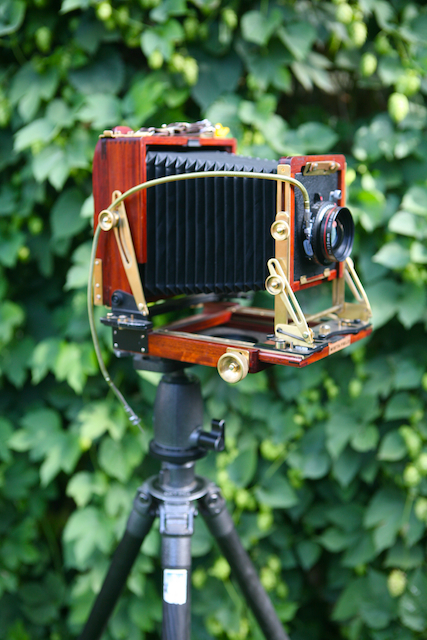 My 4×5 camera , “The Big Rig” which I use to capture all of the images in my fine art landscape portfolio. THE CAMERA. WHY I STILL USE A LARGE FORMAT 4X5 CAMERA FOR ALL OF MY FINE ART PRINTS. 1. I like it! I like working with a semi-historic camera, I like the feel of it’s cherry wood body, I like the feel of the brass fittings and I like the fact that I feel like I am creating art with art when I am composing a scene with this beautiful camera. It is a very Artisan way of capturing and creating fine art images. In a time of ever advancing digital technology, Film simply film simply feels more real to me. I consider myself a documentary artist. 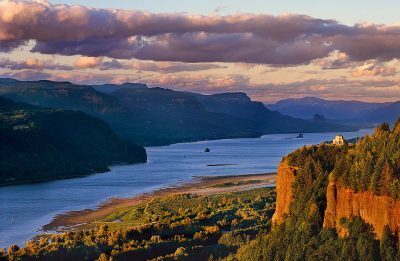 My intention is to capture natural scenes at their very best with minimal post processing. My 4×5 camera helps keep me in touch with that intention. 2. The deliberate process of using this camera makes me fine tune my images before exposure. This camera is largely the opposite of modern digital cameras with which you can fire away without discretion. The film is expensive as is the processing. I estimate that it costs me about $10 per exposure with this camera. The inherent deliberation required with using this type of camera, combined with the cost forces me to pay attention to composition, exposure and focus. This extra attention to details actually saves me time in post processing and that I like. 3. Perspective Control. Large Format cameras like mine are made with bellows so that the film plane and the lens plane can move separate of one another. This separate movement allows me to change the plane of focus in a given shot so that I can get a larger percentage of a given scene in sharp focus than is possible with digital and 35 mm cameras. 4. Large format photography requires large image files Part of the reason that I refer to my camera as “The Big Rig” is that it is physically large. The other reason is that it has a very large film format(4 inches x 5 inches, thus the term 4×5 camera). The magic of this kind of camera lies in this large film format. I have to enlarge my transparencies very little compared to digital and other types of film cameras when I want to make a large print. Because of this large film format, I can also make an exceptionally detailed fine art print at very large print sizes. I’ve read that a slow speed 4×5 transparency can be drum scanned and is the equivalent of a 150 megabyte digital camera. That’s huge and that is a big part of why I love this camera. I use a Gitzo 1228 Carbon fiber tripod and I love it. (Come on Gitzo, how about a little sponsorship money!) It is light for a tripod that is so sturdy because of the carbon fiber material that it is made of. It has plenty of stability, adjustability and it does a good job of dampening vibration which allows me to create images that are crisp and wiggle-free. I also use a Gitzo ball head, for a full range of camera focusing options. I carry a small stable of lenses when ever I go out shooting. Because telephoto lenses tend to have lower image quality than fixed lenses, I have opted to use only fixed lenses in my lens collection. 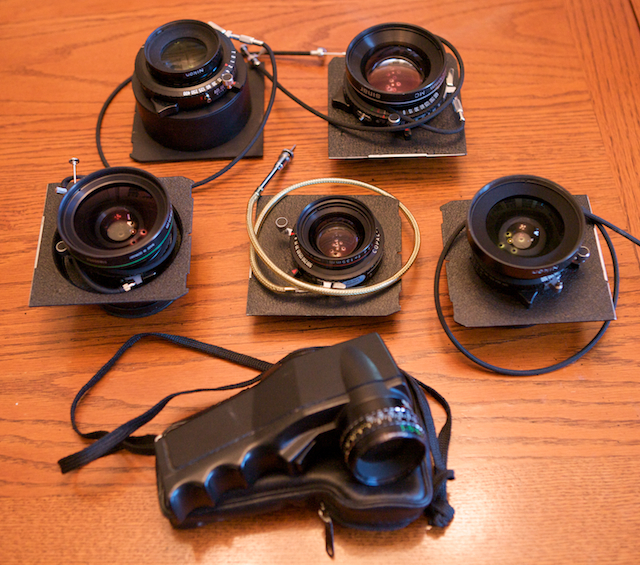 My lens collection is pictured below. 4×5 camera lenses tend to have a field of view that is 3x wider than the equivalent 35mm lenses. That is to say that the 75mm lens for my 4×5 camera is roughly equivalent to a 25mm lens on a 35 mm camera. My lenses include a 75mm,90mm,135mm,210mm, and 300mm. In terms of a 35mm camera, this collection does not allow for a very long/telephoto option. This is fine with me. In general, the further away a photographer is from his or her subject, the lower the image quality is. Not having a longer lens option, forces me to get closer closer to my subjects and therefore I have more sharpness in my images and greater image quality. It is simultaneously a self control and a quality control mechanism! These lenses are all very specialized and therefore very expensive but without a great lens you cannot have a sharp image, so I’m willing to pay the price. The pentax spot meter at the bottom of the above picture is the tool I use to take light readings which I then use to calculate exposure times. The fact that it is a 1 degree spot meter means that it samples light from a circle only 1 degree in diameter. This gives me greater control over exposure which is especially valuable is some unusual lighting situations. These are the high points of my large format photography gear collection. I have a hand full of other goodies that accompany me on my photography outings, but they aren’t as critical as my camera, lenses, and tripod. If you are an aspiring photographer and would like some further information or advice about photography gear, please feel free to contact me through the “contact” tab at the upper right hand corner of the home page of this website. Beautiful photos, Mike. 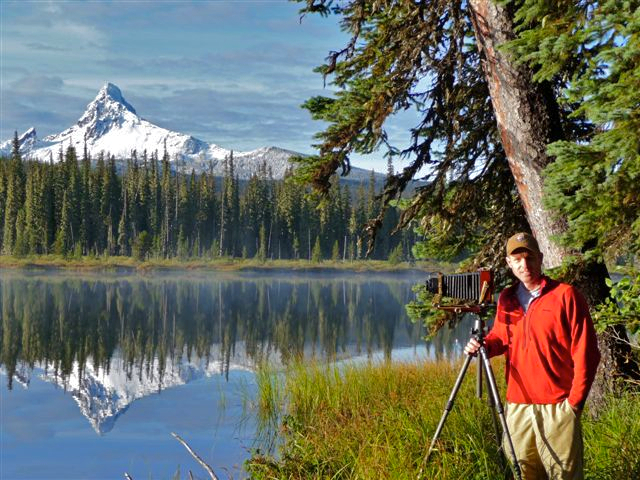 I’m a landscape photographer too, and have been researching web sites to see how good photographers present their work. Glad to see some others using film. I switched to digital 12 years ago when I was a motorsports photographer, but just transitioned back to film when I found a mint Hasselblad 501CM. Sold all my EOS gear on eBay for substantially more than the 501CM cost. Drum scanning is definitely the way to go. I got burned out on darkroom work some time around 1999. The drum scans from my 4×5 work make 31×40 prints at 300 dpi without upscaling. The 6×6 scans make 34.5×34.5 prints at 300 dpi without upscaling. The 4×5 scans are at 2450 dpi, the 6×6 scans at 4500 dpi because I figure 31×40 is large enough and didn’t want to spend the extra money on a 100MB scan. If you pay for a 4500 dpi scan on a 4×5 original it would be equal to a 400 megapixel digital camera, assuming I did my math right. At 2450 dpi it is equal to about a 102 megapixel digital camera. I’ll go back to digital when 80 megapixel backs drop down to an affordable level. Keep up the good work. Looking at your images makes me want to go out and take photos. 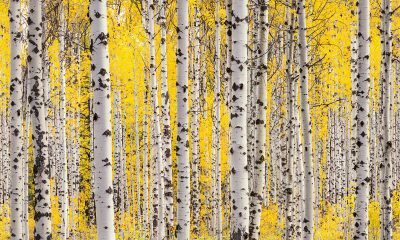 Fabulous work, indeed you are documentary artist ever changing landscape and you are preserving the light, colors and depth of natures. I really appreciate your work and for sharing whole lot of information. Hey Mike. Love your rig. I am using pretty much the same setup, a Wista Zone VI and a Deardorff 4×5 Special. Love large format. Being sort of a wide angle nerd I managed to get 65mm Nikkor on the Wista with a deep recessed board. the amusing part is that I typically need to find a twig to adjust my settings. I ended up getting the deardorff because aside from being beautiful it has enough extension for a 450. BTW: per the scanning issue. If you have not tried it, I have found multiple image “DSLR scanning” merged in photoshop. to be nearly as clean as drum scans (to the point where you cannot tell the difference).